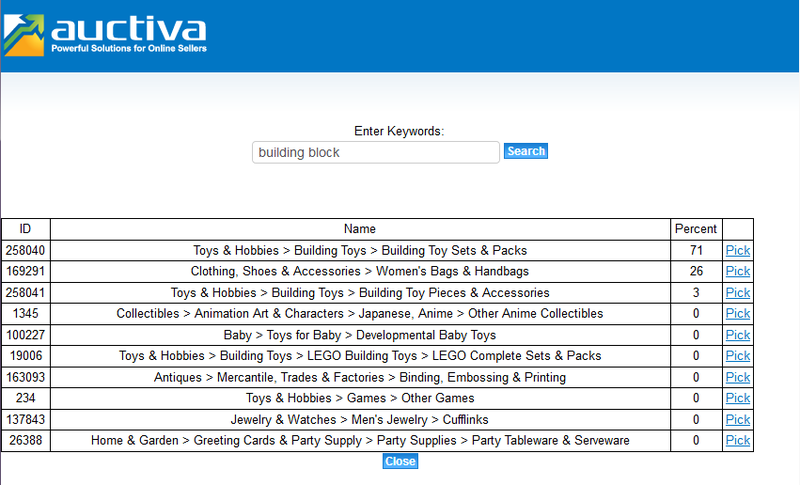 The Auctiva Lister has a lot of options that enable you to customize a variety of features for your listings. This tutorial will guide you through each field in the Lister. Step 1. eBay Site options. eBay Site: Choose which eBay site will be the destination of this posted listing (Figure 1). Figure 1. Choose an eBay site. Step 2. Choose Sale Type. Auction: This listing will be listed as an auction item, where buyers will place bids to win the item. Fixed Price: This listing will be listed with a fixed price that allows buyers to purchase the item immediately. Figure 2. Choose the type of sale. Step 3. Enter Item Details. Title: Enter the title of this listing into this field (Figure 3). The title appears to buyers when they are browsing listings. Subtitle: Enter a subtitle for this listing, if you desire. Subtitles are optional and usually incur additional eBay fees. SKU: Enter a SKU for this listing, if you desire. This is an internal field used for inventory management and will not display on the Active Listing to buyers. Figure 3. Title and subtitle for the listing. Step 4. Enter Item Details: Categories. Category #: You can browse for a first category by click on the Browse button (Figure 4.1-B), or you can search for related categories by clicking on the Search button (Figure 4.1-C). Figure 4.1. First category from recently used options (A). Browse for first category options (B). Search for first category options (C). Note: Make sure your Internet browser allows pop-ups from Auctiva, otherwise you will not see the necessary listing tools. Browsing Categories: If you choose to browse for a category, click on the Browse button. The Category Browser window will pop up (Figure 4.2). In the drop-down menu, select the appropriate category. Once you make your initial selection, sub-categories will appear in additional list boxes (Figure 4.2-A). Make additional selections until you reach the final category that you desire. If you need to change a selection, simply make the change in the drop-down menu or list box. The options will automatically update. When you've made your final selection, the Category # will appear at the top of the page (Figure 4.2-B). Click on either of the Choose buttons to make this selection. The Category # will appear in the "Category #" field. Figure 4.2. Sub-category options (A). Category # (B). Searching Categories: If you choose to search for a category, click on the Search button. The Search Category window will pop up (Figure 4.3). Enter the search term that you would like to use. Click on the Search button. The search will return the options related to the category that you entered into the field. If you find the category you wish to use, click on the "Pick" link next to the related category. This will load the Category # in the "Category #" field. If you do not find the category you're looking for in the search result, try a different search term. If all else fails, use the "Category Browsing" option (above). Figure 4.3. Search Category window. Second Category: You can add your listing to a second category, if desired. Second categories are optional and usually incur additional eBay fees. 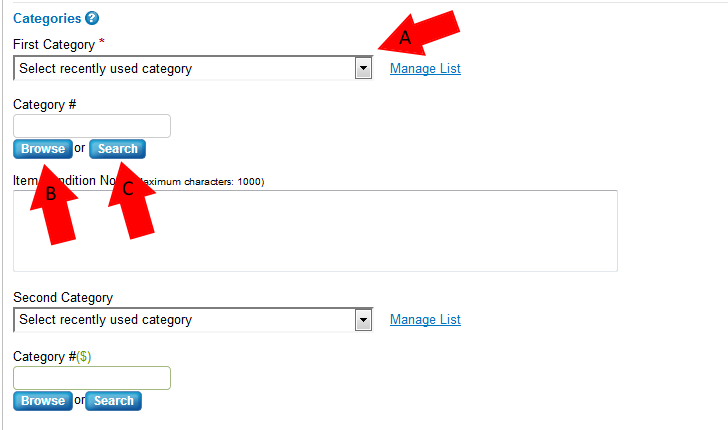 If you choose to add a second category, use the category selection instructions provided above to make your selection. Step 5. Enter Item Details: Item Description. In the Item Description section, enter the description for the listing (Figure 5). You can switch to the HTML editor by clicking on the Source tab (Figure 5-A). When using HTML, make sure to use only HTML code. It's a good idea to validate your HTML code before you post your listings. 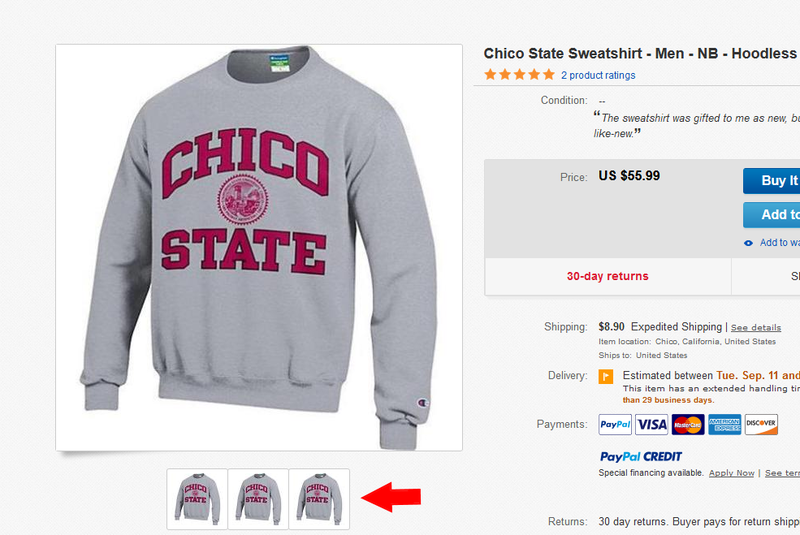 If this is a consignment item, select the checkbox just below the Item Description editor (Figure 5-B). The field will be inactive if you do not have a consignment contract and commission plan set up. You can save this listing, do the consignment setup and return to this listing to select this checkbox, if necessary. If this is an inventory item select the checkbox just below the Item Description editor (Figure 5-C). The field will be inactive if you do not have inventory set up. You can save this listing, do the inventory setup and return to this listing to select this checkbox, if necessary. Figure 5. Switch editing mode link (A). "Consignment" option (B). To add an image to the listing, click on the "Select An Image" icon per each image. The Image Selection pop-up window will load (Figure 6.1). If your images have not already been uploaded (we import your images from your closed listings if you import them into your saved listings), you can upload them now by clicking on the Upload button. Skip the "Uploading Images" instruction to simply make an image selection from your current images. Figure 6.1. Image Selection window. 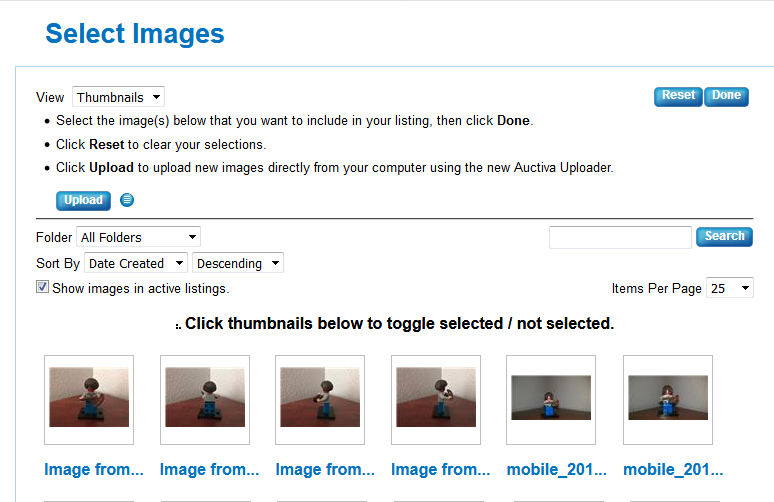 Uploading Images: By default, the Auctiva Uploader will load (Figure 6.2). Use the "Browse" button to find files on your computer (Figure 6.2-A). This will allow you to search for the location on your computer where your images are stored. Image files must be in JPG, PNG or GIF format. Click and drag images into the "Image Upload" box (Figure 6.2-B), or make multiple selections from your image folder by holding down the Ctrl key on your keyboard while making selections with your mouse. Once your images are showing in the "Image Upload" box and you have completed your selections, just click the Upload button (Figure 6.2-C) to upload the images to the listing and your Image Management area. If you wish to upload the images to a specific folder, use the pulldown menu for your folders prior to clicking on Upload (Figure 6.2-D). Note that it may take a few minutes to upload your images depending on how many images you have selected and the size of the image files. 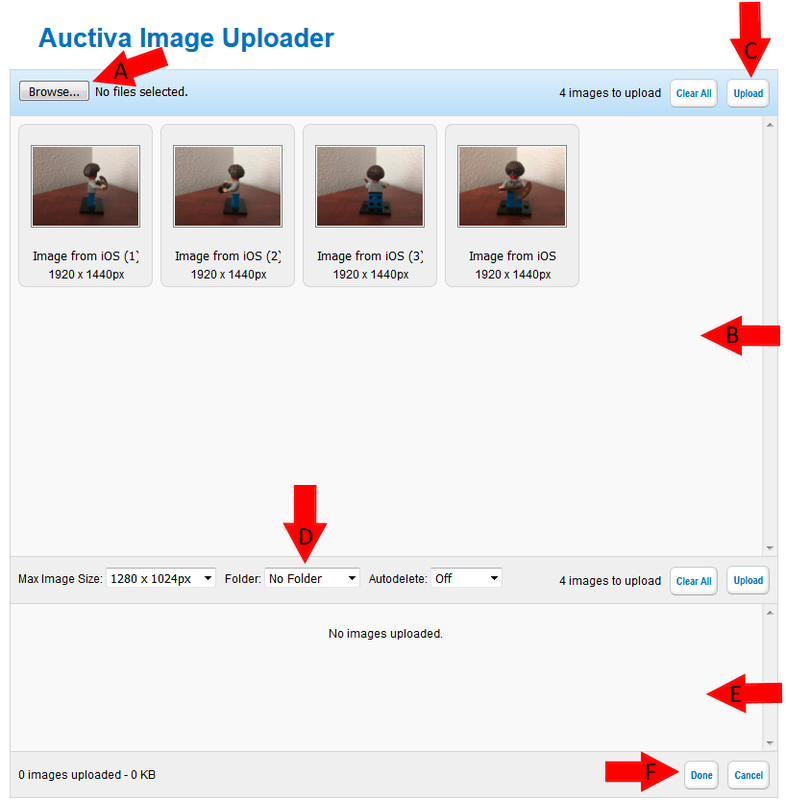 The Auctiva Uploader automatically resizes images to the maximum resolution if they are larger than the requirement (1280-pixels by 1024-pixels or 1920-pixels x 1440-pixels depending on your account settings). Once the upload is complete, the images will appear in the Image Selection window (Figure 6.2-E). Once all of the images show in the Image Selection Window, click the Done button (Figure 6.2 F). Figure 6.2. Browse button (A). "Image Browser" box (B). Upload button (C). "Image Folder" options (D). "Image Upload" box (E). Done button (F). Selecting Images: Select from already uploaded images that you want to add to the listing by clicking on the images. A number will appear on the image, noting the order that the images will appear in the listing. You can unselect an image by clicking on it again and the image order will automatically update. If you are having trouble finding the images you need, you can search for an image using the "Search" field or browse for images by choosing a specific folder in the "Folder" drop-down menu. You can also sort images by "Date Created," "Display Name" or "Last Edited." Click on the Done button to place your image selections. The Lister will be automatically updated with your selections. You can make up to 24 image selections. eBay Header Image: Select the image you wish to appear as the Header Image, if desired. The Header Image displays before and after the Description section. Gallery Image: Select the image you wish to appear as the Gallery Image, if desired. When an image is expressed for both the eBay Header Image and the Gallery Image, they must be the same. Display Image Captions: Select this checkbox if you wish to display the image captions associated with the images you've selected. Image captions are entered manually. You can save this listing, insert image captions using the "Image Management" tool and return to this listing to post it. Optional eBay Gallery Images: Checkmark the box "Enable Optional eBay Gallery Images" if you want a gallery displayed on eBay's listing (Figure 6.3). eBay fees might be applied. Figure 6.3. eBay's Gallery of images. Step 7. Enter Item Details: Price. Start Price: If you have chosen the Auction sale type, you will need to enter in the starting price for this listing. Buy It Now Price: Enter the purchase price for the Buy It Now option, if desired. If you have chosen the Fixed Price sale type, this field is required. If you have chosen the Auction sale type, this is optional and a value expressed in this field will enable the Buy It Now option on the listing. This will most likely incur additional eBay fees. Leave this field blank if you do not want to enable the Buy It Now option. Reserve Price: Enter a reserve price for an Auction sale type, if desired. If you do not express a value in this field, the listing will not have a reserve price. The Reserve Price feature is optional and will most likely incur additional eBay fees. Choose whether this listing is for "Individual Items" (e.g., a portable DVD player) or "Lots" (e.g., a lot of 50 portable DVD players). Quantity: You can only use this option if you have chosen your Sale Type (at the top of the Lister) to be a "Fixed Price" instead of an "Auction." Enter the quantity. If you have chosen "Individual Items," the quantity expressed will represent multiple auctions that can be won if the value is greater than one item. If you have chosen "Lots," the quantity expressed in the "Number of Lots" field will represent multiple auctions if the value is greater than one item. Private Auction: Select this checkbox if you want to make the auction private. Step 8. Enter Item Details: Template Selection. Locate the "Select Template" icon and click on it to load the Template Selection pop-up window (Figure 8.1). You can filter the Listing Template by keyword or color in the "Select Templates" box by clicking the menu button (Figure 8.1-A). You can search for template by entering a search term in the "Search Keywords" field. Click on the Find button to return to the search results. You can do a Quick Search by clicking on the "Recommended" button. Figure 8.1 Listing template filtering options. Once you've found a Listing Template you like, you can click on it to Preview it. This will load the Listing Template into the selector window. Look over the preview and see if it's the one you would like to use for this listing (Figure 8.2). Click on the Select button to make a Listing Template selection. The Listing Template will load into the Template Selection pop-up window (Figure 8.2). 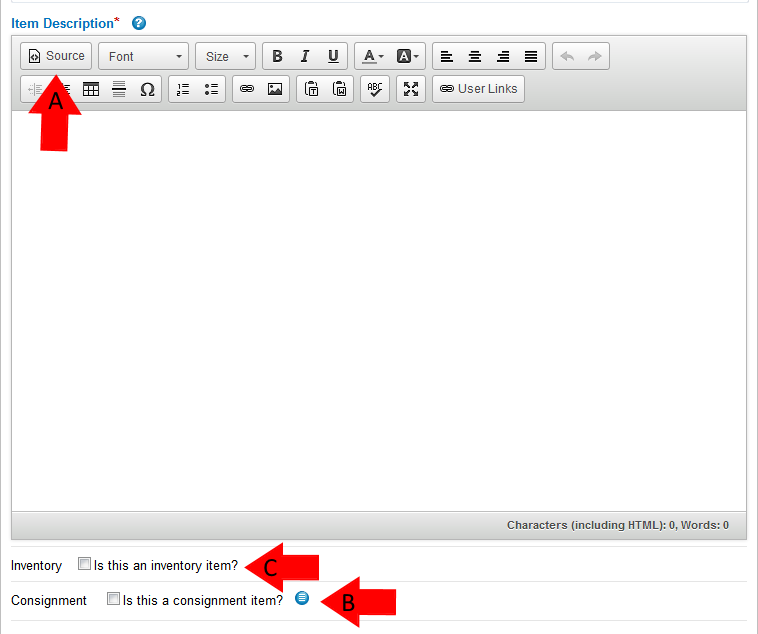 In the "Customize Layout" area (Figure 8.2-A), you can make customizations to the Listing Template. Images: Select how many images you'd like to display in the Listing Template from the drop-down menu. A preview of your selection will update in the Internet browser window_. This is required_ for your images to be included in your listing when it goes to eBay. Layout: Select the method that will be used to group the images in the Listing Template from the drop-down menu. A preview of your selection will update in the Internet browser window. 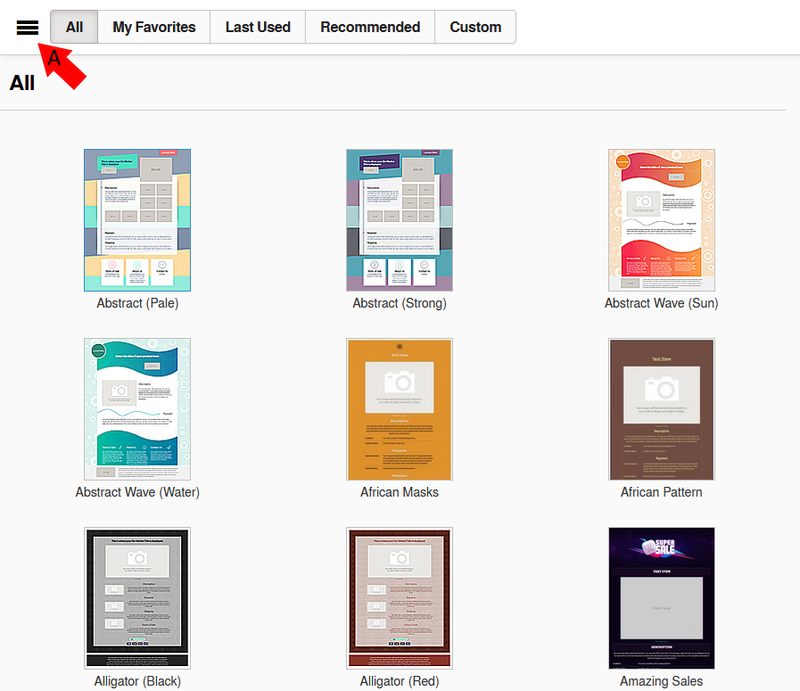 Click on the "Select" button to save your template to the listing when you finish the template customizations. The Listing Template will be loaded into the Lister. Figure 8.2. Listing Template customization options (A). Template Title: Enter a title that will appear in the Listing Template, if desired. 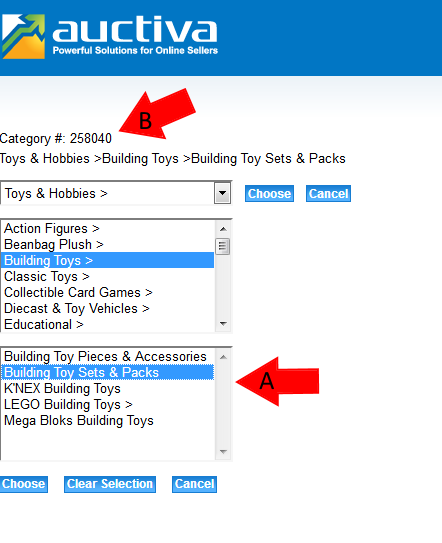 If you do not enter a title, the eBay listing title will appear in the Listing Template (Figure 9-A). Step 9. Select a Counter. Select a Counter: Choose a counter option from the drop-down menu (Figure 9-B). Counters display how many visitors have viewed the listing. A View Counter will appear in the Listing Template when you choose the "View Counter." You can choose to hide the counter by selecting the "Hidden Counter" option, or you can also disable the counter altogether by choosing the "No Counter" option. Step 10. Edit Marketing Tools. Click on the "Maximize" link to view the entire options under this section. The Marketing Tools allow you to enable marketing options provided by eBay that can help attract more buyers to your listings. With the exception of the "Gallery" option, all of these Marketing Tools will incur additional fees from eBay. To find out the exact cost for these fees, view the eBay Seller's Fees page. A brief introduction to each of the Marketing Tools is included in the list below. Make sure to click on the name to view eBay's full description of these tools. Bold: Select this checkbox to bold the listing title. A fee will be applied by eBay. International Site Visibility: For listings where the International Site Visibility feature and any other optional features are purchased, the optional features will be displayed only on the site of purchase. Gallery: Select this checkbox to add a thumbnail image next to the listing title. This is the only free Marketing Tool from eBay. 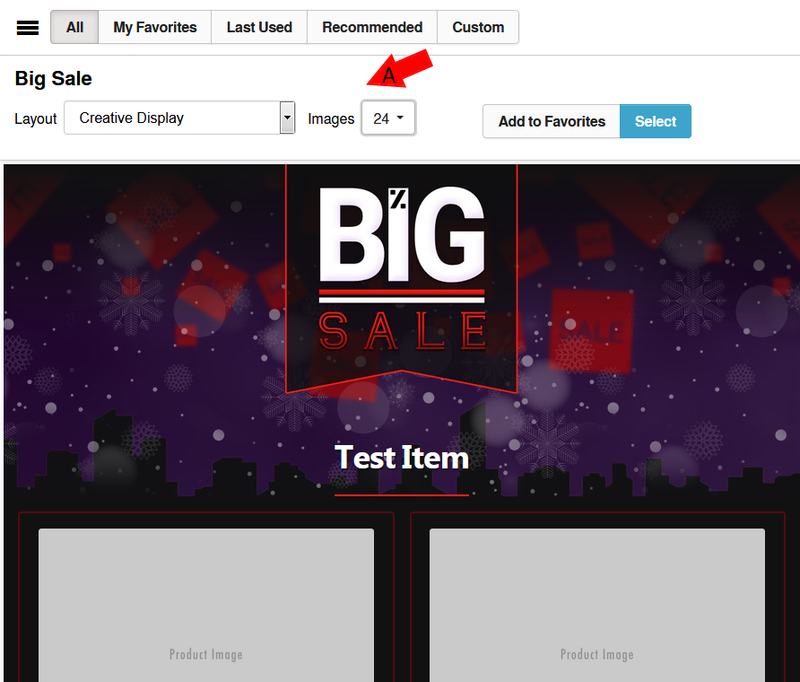 Gallery Plus: Select this checkbox to add a thumbnail image that enlarges when a buyer moves the mouse over the image. A fee will be applied by eBay. Figure 10. Marketing tool options. Step 11. Edit Shipping Tools. Zip Code: Enter your zip code into this field. Your zip code is used for buyers who search for sellers by location. This information is required by eBay. Country: Choose your country from the drop-down menu. Get It Fast: Select this checkbox if the listing will offer overnight or next-day shipping methods. When this feature is enabled, a "Get It Fast" icon will appear with the Listing. You must also choose "1" from the "Domestic Handling Time" from the drop-down menu if this feature is enabled. This is the amount of time it takes you to get the purchased item to the carrier for delivery. Domestic Handling Time: Choose the duration it will take to get the product to the carrier for shipment. You must choose "1" if you enabled the "Get It Fast" option. Figure 11.1. Location and Get it Fast options. Ship To Locations: Choose additional regions where the item can be shipped. Exclude Locations: Select your shipping exclusion preference. Domestic: Choose the type of domestic shipping you will offer for this listing. International: Choose the type of international shipping you will offer for this listing. The default is "Will Not Ship International." If you choose to ship internationally, the International Shipping Services section will appear. Enter the necessary information as you would in the Domestic Shipping Services section. Figure 11.2. Ship To Location, Domestic and International options. Domestic Shipping Services: Choose the shipping service you will use to ship this item from the drop-down menu (Figure 11.2-A). Cost: Enter the shipping cost into this field. Enter "0" to specify "FREE Shipping" if you want to offer free shipping in this listing. Additional Item Cost: Enter any additional shipping costs, if necessary. Make sure your charges do not violate eBay's "excessive shipping charges" policy. You can add more shipping services for customers to choose by clicking on the "Add another service" link. Combined Shipping Discounts: Select this checkbox to apply your eBay promotional shipping rule for combined shipping discounts. These settings are configured on eBay's website. Make sure they are set up properly before enabling this feature. In the Auctiva Shipping Insurance section (Figure 11.2-B), you will have the option to provide shipping insurance for this listing. If the Auctiva Shipping Insurance status is "Disabled", read the Auctiva Shipping Insurance tutorial to learn how to enable this feature. The Auctiva Shipping Insurance is the same type of shipping insurance offered by major carriers. The difference is that we provide it to our sellers at a lower cost. This completes the Shipping options. In the next step, you will configure the Checkout options. Step 12. Edit Checkout Options. Figure 12. Payment method options. 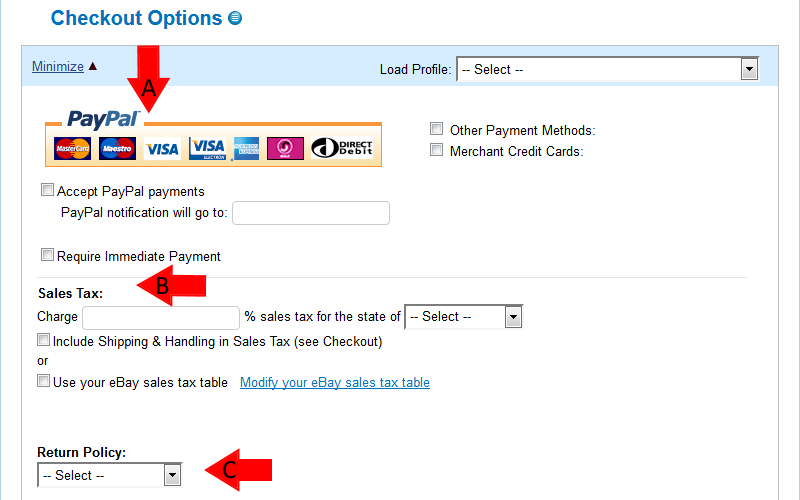 Accept PayPal payments: Select this checkbox if you want to accept PayPal payments (Figure 12-A). Then enter your PayPal user ID (i.e., the email address related to your PayPal account) into the adjacent field. This is the account that the payment will go to when a PayPal payment is made by the buyer. Require Immediate Payment: Select this option if you want to require the buyer to immediately make a payment. Other Payment Methods: Select this checkbox if you want to offer Personal Check and Payment On Pickup payment methods with this listing. When selected, these additional options will appear. Merchant Credit Cards: Select this checkbox to add credit card payment methods. This requires that you have a merchant account that processes these credit cards (i.e., Authorize.Net account). Sales Tax: Enter the percent value that you will charge as sales tax to the buyer (Figure 12-B). Also, select the state/region that applies to this sales tax. Include Shipping & Handling in Sales Tax: Select this checkbox if you want to include the sales tax in the shipping & handling fees. Use your eBay sales tax table: Select this checkbox if you want to use the eBay sales tax table. Click on the "Modify your eBay sales tax table" link if you want to make any changes to this table. Item must be returned within: Choose a duration in which the item must be returned. It's a good idea to also express this duration in further detail in the "Additional return policy details" section. Refund will be given as: Choose a refund method. This method is how you will compensate the buyer in the event that the item is returned. Return shipping will be paid by: Choose whether the shipping charges for the return shipment will be paid by the "Seller" (i.e., you) or the "Buyer." Additional return policy details: Enter any additional return policy details in this field. Additional Checkout instructions: Enter any additional checkout instructions in this field. This completes the Lister details.